Weybridge Elementary School fourth-grader Juliette Hunsdorfer shows off a copy of 'The War That Saved My Life,' while sixth-grader Narges Anzali listens to another reader's comments about the book. A group of Weybridge Elementary School readers are meeting with school librarian Megan Sutton to discuss the historical novel. They're in different grades, but they have something in common: They all really liked the book, although they found some parts hard to take in. "I was really excited when I heard that this book was going to be the book that we're talking about," says fifth-grader Sophie Mason. "And I was a little bit nervous because the book is ... really intense." In the story, 10-year-old Ada is badly mistreated by her mother. Mam, as Ada calls her, is embarrassed by the fact that Ada was born with a deformed foot. Instead of having the club foot treated when Ada was a baby, her mother confined her to their London apartment. Ada hasn't learned to walk and she isn't allowed to go outside. Ada has never gone to school. She has to go to the bathroom in a bucket. Her mother punishes her by locking her in a cockroach-infested cabinet under the sink. Sophie and the other Weybridge Elementary students have a lot to say about the book, as well as some questions for the author. Weybridge Elementary School students, ranging from fourth-graders to sixth-graders, enjoyed reading and discussing 'The War That Saved My Life.' Front, left to right: Julia Richmond, Sophie Mason and Addison Schnoor. Back, left to right: Juliette Hunsdorfer, Narges Anzali, Nyna Cole and librarian Megan Sutton. Sophie Mason: I was wondering why Ada's mother shamed her and made her feel like she was less than she was? Kimberly Brubaker Bradley: Ada's mother is really a bad person. She's not a good person. And she kind of uses her power over Ada as a way to make herself feel better by being really nasty to somebody. There's not an excuse for it. I absolutely deliberately didn't give a real reason for Mam being the way she was because I didn’t want people to say, 'Oh, she couldn’t help it, this and such thing made her do that.' But nothing really made her do that. She was just not a good person. She doesn't get an excuse. There are, unfortunately, some people in this world that aren't nice and Mam's one of them. Addison Schnoor: I was wondering why you made her disability be a club foot and not something else? Kimberly Brubaker Bradley: I wanted this to be a situation where this evacuation – which was really difficult for most of the 3 million children who were evacuated – was actually a really good thing for one particular child. And so to start with, I really needed Ada confined, kind of in a prison in that apartment. And one of the ways I did that was by making it really hard for her to walk. … A club foot was useful because it only affects her foot. It doesn't affect any other part of her. It doesn’t affect her other leg. It doesn’t affect her hands. It doesn’t affect the way she thinks. And it's still something that happens really often, but it's very easy to fix and it was easy to fix back then, too. So it also had the kind of advantage of it was an example of how Mam neglected Ada. And then also, an untreated club foot … is still pretty unsightly to look at. It looks deformed. It looks like something she could be made to feel ashamed of. Ada decides she won't be trapped in that apartment forever. While Mam is at work, she secretly teaches herself how to walk, despite her twisted foot. Outside the prison of her apartment, the German bombing of London is imminent, and many parents in the city put their children on trains headed to the countryside, where they will stay with strangers. That's how Ada and her brother Jamie make their escape. They get off the train in Kent, where an iron-faced woman with a clipboard takes them to the home of a woman named Susan Smith. At first Susan doesn't want to take the children in, but she's not really given a choice. And despite feeling unwelcome, things start to improve for Ada and Jamie. Juliette Hunsdorfer: Is Susan Smith based off a motherly character in your life? Kimberly Brubaker Bradley: Susan Smith is not based off anybody in my life … Writers are kind of spies, and we take pieces from all sorts of things that happen to us and kind of combine them into something new – think of more like a mosaic than a painting, where all the little pieces come from somewhere else. Susan is meant to be Ada's true mother, but she's not anybody I know in real life. But some of the aspects of her character that make her a good mother come from people I know that are like that. Having never known life outside her apartment, everything in the country is new to Ada. And having spent most of her time alone, Ada doesn't know what to expect from other people. "The only person she'd really ever met was her mother," sixth-grader Narges Anzali observes. "So she had this picture that everybody was like her mother and everybody was just so cruel to people who had disabilities and they deserved it – she deserved it because she had a disability, and her mother made her think like that. "And I feel like for the first few weeks she was with Susan, she was kind of in denial that someone would actually love her, because what she'd been told her entire life was that everybody hates you because you are different. And I don't think that's right at all." Julia Richmond: Was this hard to write for you? Was it hard to read over? Kimberly Brubaker Bradley: So the book was really hard for me to write. Not because that kind of thing was hard for me to write about – abuse. It's actually because you have to write about it in a way that's accurate and truthful, but also isn't so terrible [so] that you don't want to stop reading. So, the beginning, we have to get kind of out of that apartment really fast. And we have to have the right tone of writing, so that people understand that Ada's still strong … that she stands up for herself, that she's somebody you want to cheer for. So, that took a lot of rewriting and rewriting. Although The War That Saved My Life tackles some tough subjects, these Weybridge Elementary students got a valuable reality check from reading it. "When you're thinking like, 'This is the worst day ever!' just try and put yourself in other people's shoes, like Ada's, and think about how lucky you are," advises sixth-grader Nyna Cole. "Like, do you have a disability? You might. But you might not. And think about if you live in a nice house and if you have a bathroom. Like, Ada didn't have a bathroom. Are you stuck in the cupboard? No." The War That Saved My Life highlights one fictional girl's triumph over horrific adversity, during a time when horror and adversity were truly everywhere. The novel was one of 30 titles nominated for this year's Dorothy Canfield Fisher Children's Book Award, and a winner was recently announced. Middle-grade readers across Vermont voted for their favorite book, and the contest was so close that votes had to be recounted. The Terrible Two by Jory John and Mac Barnett was victorious, but The War That Saved My Life was a close runner-up. The debut novel by Alex Gino is called George, which is also the name of the main character. But Gino refers to it as Melissa's story. George is a fourth grader, assigned male at birth, but who secretly thinks of herself as Melissa. 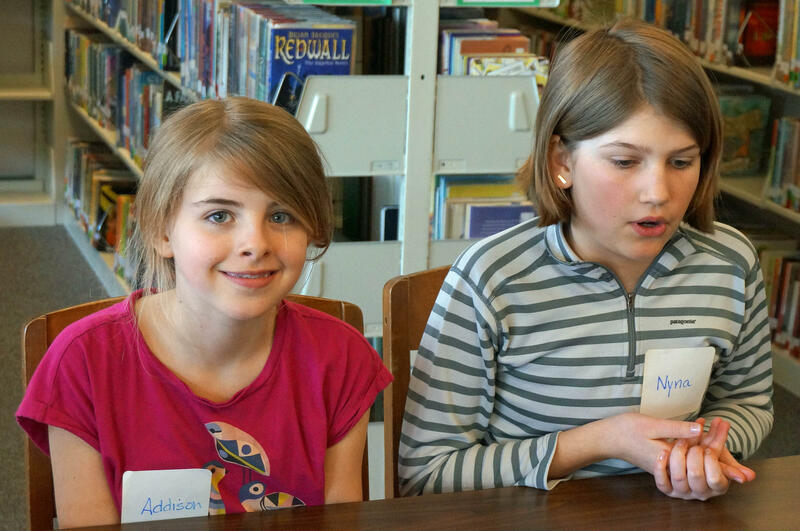 Students at Waterville Elementary School are gathered around a classroom table, deep in discussion about the characters in A Night Divided, especially the book's main character – 12-year-old Gerta, who lives in East Berlin. 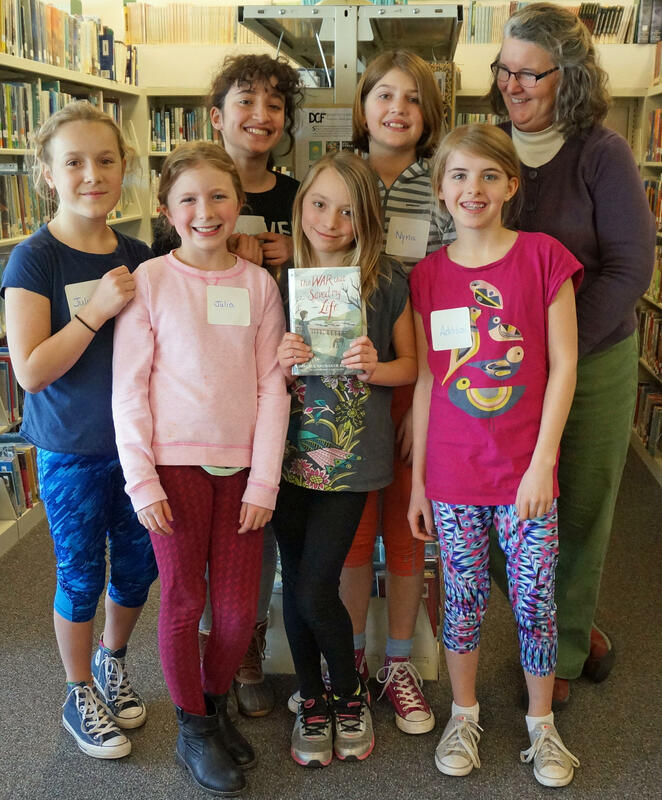 If books are supposed to open up new worlds to readers, then Victoria Jamieson's graphic novel Roller Girl has hit its mark with a group of young readers at the St. Johnsbury Athenaeum. Sixth-graders from the Vermont Commons School in South Burlington file into Pierson Library and head up a short set of stairs to a grand room: Shelburne's historic town hall. The class is here to discuss Shadows of Sherwood, the first book in the "Robyn Hoodlum Adventures" series. One long table dominates the open space in the center of the tiny, 150-year-old Peabody Library in Post Mills. Around that table, a group of Dorothy's List readers – ranging in age from 9 to 11 – are tying lengths of rope into knots. The knots are keeping their hands busy as they discuss the book Circus Mirandus.